I guess he loves more of Black and White Minimalism, as he sometimes edits my Colored Photographs, converts them into Black and White, e-mails me and asks, How does that look? 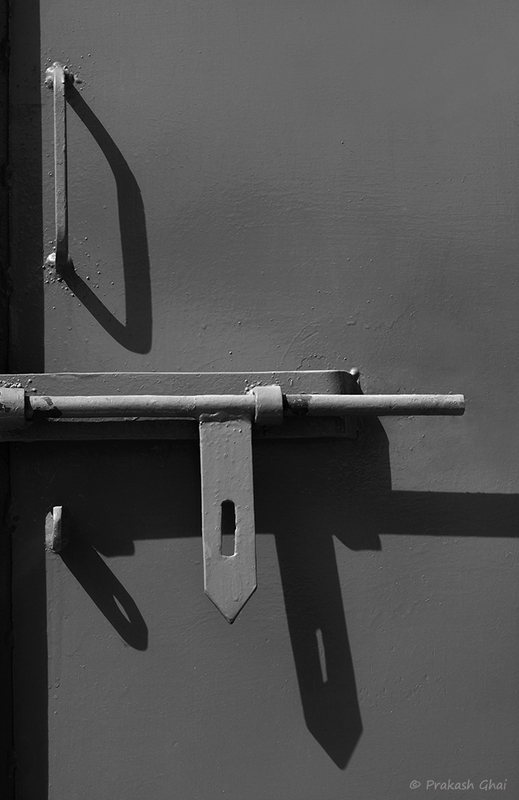 So this Black and White Photo of Door Handle Shadows is for you Steve. I know here, I am not giving you all the three "Light, Medium and Dark" Shades that you like, but instead just Medium and Dark. Hope you like it... The original color was Blue by the way. Anyways, the Photo falls under Minimalism as Less Elements category of Minimalism. Yes, Less Elements, I am sure Jay Gould (who manages a Facebook Minimalism group and keenly follows my work), would be surprised and say that there are three elements here, like 3 Different Handles. Well, here The Subject in totality is the Long Shadows of the 3 Door Handles (one being a hook sort of a thing, which I have called a handle just for convenience) treated as one. The Shot has been taken with Canon 600 D with 50 mm F1.4 Lens. Location is, near Diggi Palace Jaipur.